NPCIL is well known as “ Nuclear Power Corporation India Limited”. This organization is a premier Public Sector Undertaking company under the Administrative Control of the Department of Atomic Energy, Government of India. NPCIL Company is involved in the Design, Building, Commissioning and Operation of Nuclear Power Plants in the our Country. A fresh NPCIL Careers making opening is currently out for the Deputy Manager, Station Officers and other job profiles. NPCIL invitations for the online Government job applications from the all qualified Indian People for the following posts to share these challenging spectrum responsibilities. There are total 94 vacancies which are going to fill up through this NPCIL Recruitment process 2018. We took this information related to this NPCIL Careers making opening from the official PDF file which we found on the official website of NPCIL department. At the Last of this article under IMPORTANT LINK Section we shared the official LINK of that PDF file. For more information read out the complete article carefully. Pay Band: Rs. ₹61,149/- per Month. Education: a) Graduation in any discipline with not less than 60% marks. b) Two years full time MBA or equivalent, with specialization in Personnel Management & Industrial Relations (or) MA (Personnel Management & Industrial Relations) from TISS. b) CA/ICWA with pass class (OR) 2 years full time MBA (OR) equivalent with specialisation in Finance from a recognised University / AICTE approved Institute, with not less than 60% marks in the Post Graduate Degree/Diploma in aggregate. Education: a) Graduation in Engineering in any of the branches. Education: Full time degree in Law (Professional) with not less than 60% marks in aggregate from a University recognised by the Bar Council of India. Pay Band: Rs. ₹38,586/- per Month. Education: Master Degree of a recognized University in Hindi/English, with English/Hindi as a main subject at Degree level. Master’s Degree of a recognized University in any subject with Hindi & English as main subjects at degree level. Master’s Degree of a recognized University in any subject with Hindi/English medium and English/Hindi as a main subject at degree level. Master’s Degree in Hindi/English or in any other subject with Hindi/English medium, with English/Hindi as main subject or a medium of examination at degree level. 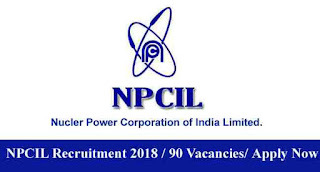 How to Apply For this NPCIL Recruitment? 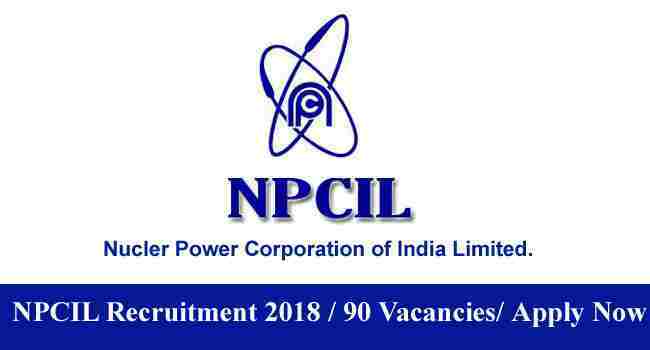 Those who satisfied all the eligibility conditions which we explained above in this article can apply online for this NPCIL Careers making opening 2018. Candidates can apply online through NPCIL official website, we also shared the link under IMPORTANT LINK section for applying. The link for applying through the website will be active on 04th Dec. 2018 and that link will remain activated up to 19th Dec. 2018. 4TH Dec. 2018 is the Starting Date to apply. 19th Dec. 2018 is the Last Date to apply.